Kuwait's Ambassador to the United States Sheikh Salem Abdullah Al-Jaber Al-Sabah made a field visit to MedStar Georgetown University Hospital on Monday. The visit came in order to be introduced to the hospital's newly-developed departments, as well as get acquainted with up-to-date medical techniques, especially within the cancer care unit, headed by Kuwait's Dr. Wadah Al-Rifaee, a press release by the embassy noted. 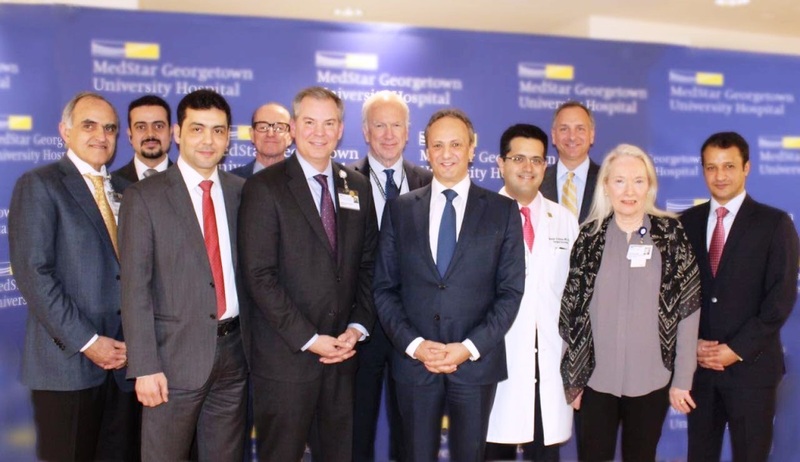 It added that Ambassador Sheikh Salem was escorted during the visit by Michael Sachtleben, President of MedStar Georgetown University Hospital. Ambassador Sheikh Salem was accompanied by head of the health office in Washington D.C. Dr. Ali Al-Enezi and Counselor Nawaf Al-Enezi, where they all paid visits to Kuwaiti patients being treated at the hospital to stand on their needs. Also during the tour, the ambassador met Kuwaiti Dr. Wadha Al-Jassar; an intern at the hospital. Voicing appreciation to the hospital management for including Kuwaiti nationals in its staff, Ambassador Sheikh Salem reaffirmed that the State of Kuwait is keen on benefiting from the hospital's medical expertise. MedStar Georgetown University Hospital is a not-for-profit, acute-care teaching and research hospital with 609 beds located in Northwest Washington, D.C.